electrodes of up to 5mm diameter. 100% efficiency at 180 amps. May work with a generator of 15KVA output. 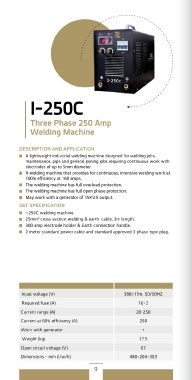 25mm2 cross section welding & earth cable, 3m length. 300 amp electrode holder & Earth connection handle. 2 meter standard power cable and standard approved 3 phase type plug.